Banbury United boss Mike Ford has made an addition to his squad. Sean Whaler has joined the Puritans on a youth loan deal from Northampton Town. The 18-year-old attacking midfielder is a versatile player, who as well as playing on either flank can also play in a more central attacking role as well as at right-back. He joined Northampton Town at under-9 level and has progressed through their academy to complete his scholarship and sign a two year professional deal last summer. Whaler has made two first team appearances for the Cobblers so far this season, coming on as a substitute in two Checkatrade Trophy games against Wycombe Wanderers and Fulham Under-21s. 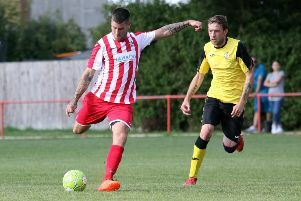 Whaler has recently completed a two-month loan spell with Northern Premier League East Division side AFC Mansfield, playing regularly on the flank for their first team. He now steps up a level to have a spell on loan with the Puritans. The loan paperwork is initially for a month and he will be available for Saturday’s Evo-Stik League South trip to Royston Town and Tuesday’s OFA Senior Cup tie with Easington Sports.